Vanyo Moody’s professional life has been made by embracing risk and change. Vanyo Moody will likely take exception to this description, but he is truly a Renaissance Man. Consider this: a Renaissance Man is defined as someone who is neither an expert nor a specialist in any one area, but rather is multidimensional and has knowledge in many different areas. Indeed, Vanyo Moody fits the bill. His time and talents are spread across his myriad of business enterprises that range from cutting edge technology to antique cars, and from developing young talent to taking care of seniors. A look at his current business interests illustrates this point quite well. “I’ve been selling specialty chemicals since 1979, have owned a janitorial supply business since 1980 and an assisted living home since 1984, plus some storage units. My partners and I started Computer Technology Solutions in 2003 and I developed The Marigold Apartments in 2010,” Vanyo says. As the leader of such diverse business interests, Vanyo also shares his treasures, which are his faith, his family and his friends (which, by the way, he considers to be everyone he meets.) He’ll tell you that all he has today, is a result of his upbringing and the many lessons he’s learned along the way. Born 60 miles from North Dakota and 100 miles from Canada in a small town in northern Minnesota where his dad had an auto body repair shop, Moody learned early the importance of hard work. “We were quite poor growing up,” reflects Vanyo. “We darned our socks and canned our own food. But we, my two sisters and I, had everything we needed, especially love from our parents. So he started putting his energy toward that goal. He attended the University of Minnesota Duluth and was conditionally accepted into medical school. One decision he made early in life that was NOT a risk though, was the decision to marry his college sweetheart, Ann. She remains by his side today. Grandfather is a role he fills from his home in the Marigold building in lower North Mankato. It’s a complex known as Marigold Apartments that he developed a few years ago. Sitting at the “gateway” into lower North at the intersection of Belgrade and Highway 169 it is also home to Computer Technology Solutions. Vanyo is CEO and co-owner of CTS. The company will celebrate 15 years in business next year. In this interview he talks about the key to CTS’ longevity in the market, how he manages to balance all his different enterprises, and the personal values that have served him well in all areas of life. 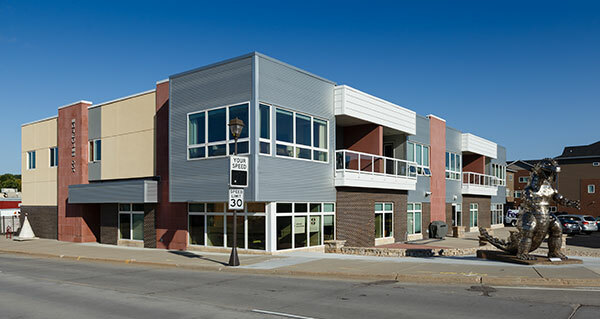 The location of CTS in the Marigold building on Belgrade Avenue in North Mankato. I know you moved to Mankato in 1987, you have business interests in Barron, Wisconsin…what brought you to Mankato? I was working for a specialty chemical company out of Canada and they needed a sales rep to cover the Dakotas, Nebraska, Missouri, Iowa and I still kept the previous territory of Minnesota and western Wisconsin-so we transferred here which was centrally located. So tell me how Computer Technology Solutions came about? In 2003, Todd Tanhoff and Tim Ray approached me about starting a technology company. They had been working for many years for other companies and wanted to start their own. We each brought different strengths. They were more technical and I had knowledge of how to run a business. We got together and it took only 19 days to launch. We began December 1, 2003 and are still working together. Tim and I are the owners now. The biggest challenge, as always, is getting good people hired and trained. What services does CTS offer? Our goal is to provide a service to companies so they can focus on their core business without spending time on supporting technologies they are not trained on. To that end, we offer full computer technology solutions which include consultation, design, sale, and installation of a company’s computer system. But we also can take care of a customer’s servers, storage and cloud based services. One big area for us is network infrastructure, both wired and wireless. We consult, design, install and support the latest wired and wireless network technologies. Computing is no longer just a desktop. Without excellent connectivity to be able to access information, whether it is on your local network, an extended WAN or the internet, your work is affected. With this comes our service in backups, firewalls, virus protection, computers and notebooks. Telephones, or what we call unified communication systems are another area of growth. Unified Communication Systems are greatly expanded phone systems that provide more than what people expect. Our communication systems are based on the latest technologies including SIP based phone lines to provide excellent integration into a company’s network infrastructure. Reporting, calls that roll to your cell phone, conference calling, automated calling and many more features are all included with the system. These are not just phone systems and overall they cost less than the old, traditional phone systems. We have expanded to also install and service security cameras and building security controls which include fobs, key cards and access code panels. And we offer remote managed services to cover all of their repair needs for servers, computers, printers and telephones. Our techs can do it remotely so it’s a much lower cost than having a tech come in and charge by the hour. Also, it is proactive so the customer won’t have any computer downtime. That pretty much runs the gamut! Who is your target clientele? Small to medium-sized businesses that have five to 50 computers are the majority of our customers. They do not have the time or the need to have a full time technical person on staff but they need their technology to work well. We provide the support they need at a price that is less than if they had their own technicians. We also provide what is called enterprise-level solutions to schools, cities, counties and other larger corporations that may have technical people on staff but need a higher level of design, installation and support for projects. When companies were first purchasing personal computers, they figured they wanted one but once they had it, they had to figure out what to do with it. Computers were cool and fun but non-essential desktop units. Many were used as a word processor with a little dabbling in a spreadsheet or a basic accounting package. Now information consumption is the key. Companies must have a solid network allowing for wired and wireless access from desk based and mobile devices like notebooks, tablets and smartphones or they are at a disadvantage. Access to this data must be fast, automatic and fully secure. We are continuously working with our suppliers to develop new and better computer technology solutions for our customers. We are partners-in-business and we take that responsibility seriously. How have you adapted to all that change? We understand Computer Technology Solutions exists to remove technology concerns from our customers so they can focus on their business. So we anticipate future technologies and how they may affect our current and potential customers. For instance, in the early 2000’s, we realized network security was going to be an issue that would affect our customers so we focused on developing an expertise in firewall and anti-virus solutions. A few years ago we saw the expansion of wireless technology as being a key issue for our customers so we dove deep into wireless solutions along with how to secure them. We maintain a strict employee training schedule for new technologies and support services. Our customers rely on us to ensure the technology in their business, or institution, does not get in the way of them running their business. Last month Seattle-based WatchGuard, one of the world’s leaders in security, was here to give a free seminar covering the latest Ransomware prevention information for anyone that wanted to attend. In September we had Alabama-based Digium, a world leader in unified communication systems, for our free seminar. By constantly training and working with leading technology manufacturers we are on the forefront in services and support. With increased competition in the market for tech services, how do you keep CTS relevant? Some companies in the business have narrowed their capabilities and specialties. We have enlarged ours. Our goal is to supply everything possible in the Computer Technology Solution field that our customers need. We even do low voltage wiring. It is so important to know what computer equipment the wiring is going to. If done improperly, it can harm and/or not achieve optimum efficiency for the customer’s equipment. We stay relevant because we are knowledgeable. 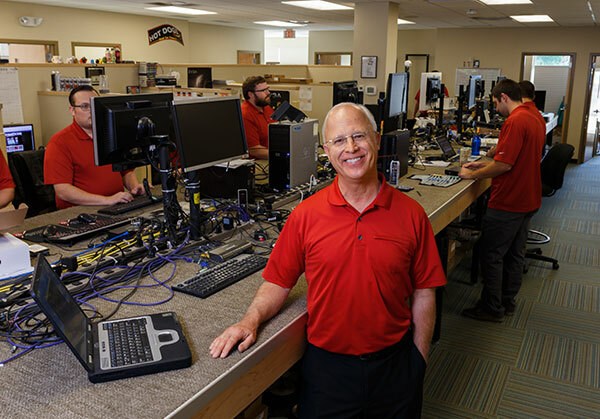 Our Computer Technology Solution Consultants have been in the business for a long time: Tim Ray since 1979; Todd Tanhoff since 1989; Mark Reedstrom since 1984, Jason Fast since 1995 and Chris Bauer since 2006. We are blessed to have such knowledgeable, and more importantly, good people as representatives of Computer Technology Solutions. The continuing education that all of our staff has to take to meet our supplier’s demands (HP, Apple, WatchGuard, Hewlett Packard Enterprise, Microsoft, Digium, Axis, Aruba and so many others) means we have to be committed individuals and a supportive company to keep significant in the marketplace. One of our slogans is: “At Your Service, Today and Tomorrow”. We plan on fulfilling that promise. You always credit your great team of individuals. Can you talk about the importance of your team? Teamwork makes the dream work! On December 1 we will begin our 15th year. In the last few years our service department has been rejuvenated. 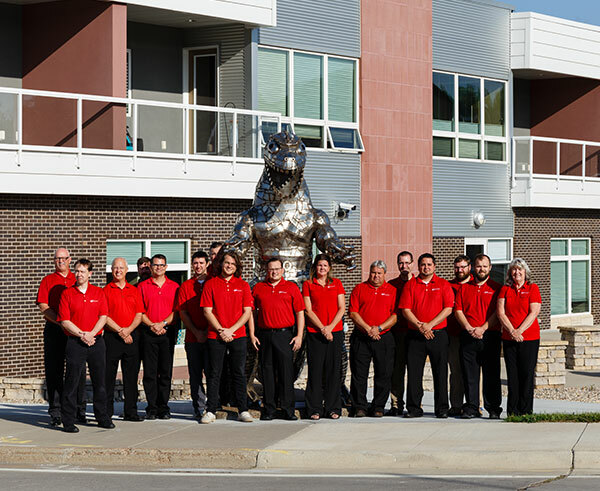 Credit goes to our Chief Operating Officer & Service Manager Xac Dinsmore, Assistant Service Manager Jim Kline, Architect Aaron Hartwell and all of our Computer Technology Solutions Technicians, Consultants and Support Staff. This begins and ends with all of us that work here. We aspire to be more proactive and focused on who we are and what we do. We try to hire people with better attitudes, are more dedicated, more customer focused and better team players. We are blessed, and it took a lot of work to now have the most qualified, humble, teamwork oriented force that we have ever had. How do you make sure you hire to fit the culture of CTS, or really any of your other business ventures? What I value most about an employee is if they can follow the 4-Way Test. I learned this from my involvement in Rotary. This mentality is the culture of any company I lead. Once you attract these type of employees, how do you keep them? We have competitive wages, flexible scheduling and a good PTO and retirement package with a relaxed and considerate atmosphere. We have companywide meals together, Happy Hours, fantasy football leagues, paid training opportunities, March Madness brackets, company outings (we like bowling), free golf any time at a local course, Annual Employee Parties, dart tournaments and bean bags! Our job is very exciting and cutting edge including continuously learning but sometimes work can be very demanding and stressful. Spending time together/getting to know each other well, and truly listening to each other, helps employee retention. Of course we’ve said, CTS is locally owned. Talk about the importance and the culture in Mankato of folks supporting each other locally. We support local businesses. We still work with all of the contractors that built our building. Towns fold up because there is not enough business being done there. We believe that most of us Greater Mankatoans do support each other. Neighbor to neighbor, we will stand together. Let’s talk about the location. How did CTS land here and what do you like about it? What advantages are there? We had been in the Meyer and Sons location, which worked out very well, but we needed something larger. The empty lot where The Marigold Dairy had been was vacant so we bought it from the City of North Mankato. 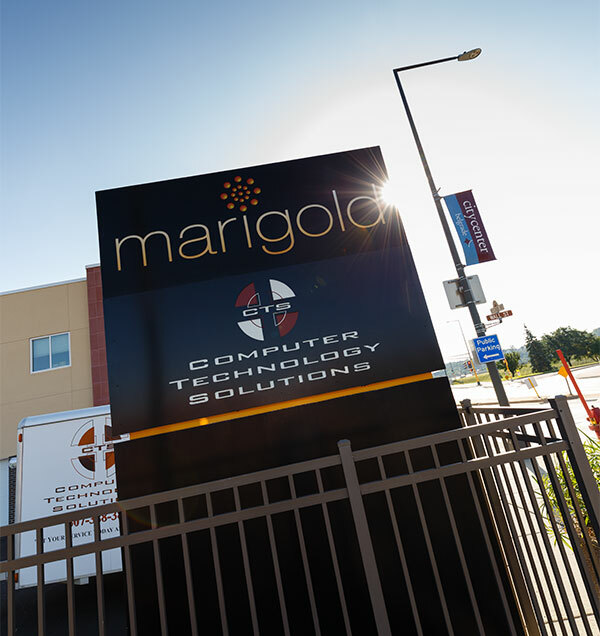 We opened The Marigold Building on December 2, 2010. 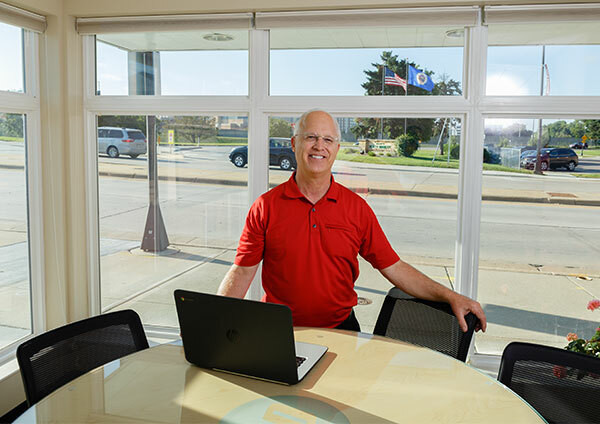 We are in downtown North Mankato and being right across the river from downtown Mankato with such easy access to Highways 169 and 14 is a great asset for us as we cover businesses mainly in southern Minnesota. We have a post office, bank, restaurants and gas station-all within one block. Great amenities for all of us employees! Vanyo, I know family is important to you. My Family, capitalized, is who I think of, and pray for, many times every day. Ann and I are in our 39th year of marriage. She is the star in my world. Our sons, Grant, Ross and John have enhanced our love and life and now Grant’s family of wife Shaila and children Isaiah, Augustine and Julia are such an additional blessing! Grant and Shaila own Express Employment Professionals in North Mankato and we were in business together for 4 years there. That time together with our son was the most enjoyable, stimulating and where I learned the most that I ever have, over a few short years. Ross is a sales rep for GE in the exciting medical imaging field and living in Bloomington so we are happy he is close. And John is a mortician managing a very interesting cremation business in beautiful Seattle. What are your interests outside of work? Any hobbies? I enjoy communicating and spending time with people. With family and friends there are a lot of activities where we gather: annual family reunions, fishing trips, cruising in old cars, meals out and traveling with Ann or friends. Cooking and working with plants are two hobbies. I am also an amateur photographer. I try to exercise almost every day at the YMCA. I like walking, biking, praying, reading, and sports-especially Minnesota teams. (he smiles) We’ll win it all next year! I try to go to church every day, usually by walking, to beg for help because I need it. Is that a hobby and/or an exercise? Is that faith one of the “keys” to balancing work and family/life for you? Three things: faith, family, friends-which is everyone on earth. I did not know if there was a Supreme Being until December 28, 1987. For 6 months I mentally asked “It” if “It” was there. Ask and you will receive does work. The Creator has, is and will continue to help because I will only ask more often because I need the help! I have no real “key”. I work 6 days a week, although not 14+ hours a day, every day or anything like that anymore. I do take 24 hours off for the Good Lord, usually noon Saturday to noon Sunday. I answer my phone, texts and emails at all times, including during vacation. What other people are doing is very important and I am here on earth to help as many as possible. The balance is to stay away from the 7 Bad Human traits: anger, envy, gluttony, greed, lust, pride and sloth. Productively keeping busy helps to stay away from those. Being responsible for employees and their families is a huge responsibility. We have as many as 82 Assisted Living Residents whose very lives depend on our Nursing and Care Staff of over 70 employees. I try to work hard and pray hard! Delegation is also important. I have been blessed to work with outstanding individuals and companies that have helped us along in life. Lisa, your stories are excellent but sometimes it seems like the people interviewed are superhuman, perfect, unnatural. I understand why, but will you portray me as just an ordinary, simple human, with faults, please? The number one goal for me is to be a better person so I won’t hurt people in the future like I have in the past. So I try to make sure every thought, word and deed of mine is good. Moody is a two-time president of North Mankato Rotary, now known as Greater Mankato Rotary. As the local branch of Rotary International, the service club speaks to Moody’s personal beliefs. He tries to follow the organization’s four-way test in everything he does. Here, Vanyo describes the history of the test. In the early 1930s Herbert J. Taylor set out to save the Club Aluminum Products distribution company from bankruptcy. He believed himself to be the only person in the company with 250 employees who had hope. His recovery plan started with changing the ethical climate of the company. In the 1940s, when Taylor was an international director of Rotary, he offered the Four-Way Test to the organization, and it was adopted by Rotary for its internal and promotional use. Never changed, the twenty-four word test remains today a central part of the permanent Rotary structure throughout the world, and is held as the standard by which the club believes all behavior should be measured.